Tips & Tricks For help with file formats, viruses, security, etc. This section is not for questions about problems with Gnutella program clients, downloading, connecting, etc. Can anyone kindly give me step-by-step directions how to change my desktop background? I am on Windows 10. My thanks in advance for your patience and help. All you need to do is Right-click the desktop and choose Personalise. Then choose Background from the side options. You are then in the right section to choose your new desktop image. Once you click on 'Personalise' you'll have the option to either choose a photo of your own or a theme from Micorosoft. To choose one of your own photos, click on the Browse button which is showing on the main Background page that you see. Use the side bar on the left hand side to navigate to where your photos are saved. Click on the photo that you want to use for a desktop background > Choose Picture. Now, that picture should replace your current desktop background. Close the Personalise window. Themes are a combination of desktop picture, window colours & sounds.To use a Microsoft theme. right click on desktop > Personalise > click on Themes in the sidebar. You can choose any themes that are showing, or click on 'Get More Themes in Microsoft Store'. Click on the theme that you want to use > Get (no need to sign in to a Microsoft account) > Apply. Now that theme will show up when you right click on desktop > Personalise. Click on the theme picture. 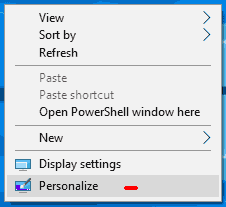 Close the Personalise window.